I am a big Pinterest fan. I also like to think I was an early adopter... eagerly telling everyone how great Pinterest is. Recently I thought of a funny word to describe something I often do on Pinterest. I see something cool and I pin it, not realizing I have already pinned it once or even multiple times. I'm a pinpeater! When I came up with this word I thought - FINALLY! I have invented a social media slang word! It will join the ranks of "Fail Whale", "pintastrophe" and "Twitterati"! 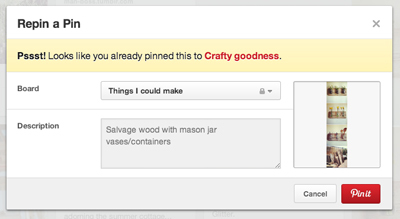 Then I learned that Pinterest added a certain new feature back in May. If you have already pinned something it will let you know. Very cool. But there goes my catchy term - certain internet fame down the tubes. "Pinpeater" is dead before it even left the ground. Well, your pinpeater hopes may have been dashed, but I tell you this: you were the person I learned about Pinterest from, and in fact, you shared an invite w/ me that allowed me to be an early user as well. Thank you!